The final was quite disappointing, at least partially because I came 7th out of 8 and lost over 100 rating points. In the end, everybody solved the easy problem and nobody solved anything else, so the winner (Jan Kuipers) was simply whoever saw the solution to this problem the fastest. The tragedy is that tomek and I both solved the medium and darnley solved the hard, but all of us had teeny tiny errors: tomek thought that a certain case wasn't worth worrying about so he disabled a check for it (enabling it makes it right), I got a second root from an equation and thought it wouldn't matter if I just tried both (a one-character change disables the bogus root and fixes it), and darnley had some tiny error too. The closing reception was a dinner at the next-door hotel/casino, Treasure Island. It turned out to be outside by the pool, which was rather warmer than I was hoping for, but at the end of the evening we went inside to the Ben & Jerry's (ice-cream shop). On returning to the hotel to go to bed I had a surreal if somewhat typically Vegas experience: two men and a woman get into the elevator with me, looking a bit drunk; one of the guys then starts telling me how they have hookers in their room and wants me to come and watch. Today I plan to try to see a few things (there's supposed to be tigers on show near a side entrance to the casino, and if I have the energy I'll go to the Bellagio to see the fountains this evening), but mostly catching up on email and blogging and work and reading and so on. Also I'll be trying to figure out how to use the iPod shuffle that I apparently won in the Verisign trivia competition. Unfortunately all the music on my laptop is in Ogg, which the Shuffle won't play, so I'm converting it all to AAC. First up: the wildcard round. tomek failed 2 of the 3 problems, but was fast enough on the remaining one (the medium) to take second place and advance to the final. That is going to significantly increase the level of competition. The Blue Man Group was more or less as I expected, i.e., a heck of a lot better than the Tournament of Kings. Some amazing visual comedy and mime (not something I'd usually see, but which I really enjoyed), some music, mainly drumming (looked skilled but didn't excite me), and some just plain weird stuff (some of it pretty amusing). At one point they had TV screens suspended from the roof in front of each guy's face, with the face on the TV screen. There was amazing synchronisation: one guy would squirt some shaving cream onto another's face (with the cream appearing on his TV-screen face). Then he changed the third TV to an advert for the razor, plucked the razor out of the add (with the hand on the TV screen perfectly synched with his real arm), and proceeded to shave the second guy. Oh, and actually only two of them were on stage at this point - the third guy was just the head on the TV. Sorry, no photos allowed, but I do have some other random pictures I'll post later. This post is written by the #2 ranked TopCoder in the world, until at least 5:40pm. I won my semi-final room, so I'm advancing straight to the finals, and a minimum of $1000, along with darnley. As a result, it also boosted my rating to 3366, just ahead of tomek (and still way behind the #1 Petr with 3753). The final is tomorrow, at 1:30pm PDT. There will be a live web-cast on http://dev.aol.com (sorry South Africans, you may well not have enough bandwidth), and if you're already a TopCoder, you can watch the action in the arena applet. Not much more to say at this point; more info after the wildcard round. Firstly, the second semifinal: tomek, the highest-ranked coder in the contest, came third, and will therefore have to compete in the wildcard round for a place in the final. He was unlucky in having a silly bug in his easy problem and also failing the hard problem (along with everybody else) - he only made the wildcard because there were a lot of failures, and only one person got even two problems right. Now, for the non-geeks reading my blog: last night we went to see "Tournament of Kings" at Excaliber, which is, wait for it... a casino! Not only is it a casino, but it's done up in a very fake garish Disney-esque castle with garish colours that probably didn't exist in the middle ages, or indeed before 1960. The actual show featured a bunch of "knights" (who were at the same time kings of assorted countries) doing jousting and sword-fighting and stuff, along with some plot involving some evil lord with demonic laughter, all of which played very loose with history, culture and mythology (it was supposedly King Arthur in charge of it all, and for some reason the kings from these other countries were the Knights of the Round Table, hence the title). The whole thing was excessively loud and seemed aimed at 10-year olds. There was also a bit tacked on the end with a bunch of acrobats, who climbed on top of each other a lot, although not in any depraved way. The plus side of the whole adventure is that I actually got to see a genuine Vegas casino wedding chappel. Folks, this is not a mythical stereotype, it really exists. 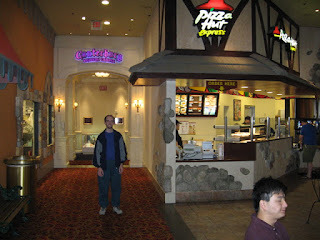 You can see it directly behind me, next to the Pizza Hut. Tonight is The Blue Man Group, which I suspect will be a bit arty for my taste, but will hopefully have a degree of intellectual engagement more appropriate to the generally intelligent people at the TCO. Also, I compete in my semifinal in just over 3 hours. Since I still have jet-lag, it's currently 6:40am and I'm drafting this entry to kill time, and also sitting in the dark so as not to disturb my roommate. Most of the readers probably don't know the structure of the algorithm contest at the final. The 48 contestants are split into 3 semifinals with 16 competitors each. The top 2 from each semi advance to the final. There is also a wildcard round, with positions 3-6 from each of the semis, and the top 2 from there also advance to the final. The first semi was this morning. ACRush, the top seed remaining in the tournament (after Petr, who is miles ahead of everybody else, made a mistake in the last online round), has been knocked out completely. That leaves tomek as the most likely favourite; he will be competing this afternoon. I'm on tomorrow, so fortunately I don't have to go up against him, although there are plenty of scary people in my semifinal. Wish me luck! I don't think I would have bothered. In the end I didn't buy any books, although I did buy a DVI cable from the Best Buy next door. But I do have some photos, which I'll paste in here just as soon as I figure out how MacOS works, which I'm using because the WiFi driver seems to handle weak signals better than the Linux one. Actually iPhoto looks pretty nice. Ok, here's the lobby. It has this amazing mini-rainforest in a dome, and then on the left you can see bits of the casino, which completely ruins the effect. There was also an amusing moment at the Subway yesterday, apart from it being in a casino. I order a small drink and start trying to put Pepsi in it, but only fizzy water comes out. The guy says to use the other dispenser machine, and also gives me a new cup that isn't half-full of fizzy water. But since he's already feeling bad for accidentally putting mayo on my sub, he replaces my normal-sized cup with a bucket, or at least that's what it looked like. So, I've got a nice, fresh, healthy low-fat sub (apart from the unwanted mayo)... and a bucket-full of sugary crap. And people wonder why America has an obesity problem. On second thoughts, let us not go there. It is a silly place. And Vegas is just as silly as all the TV and stereotypes led you to believe. 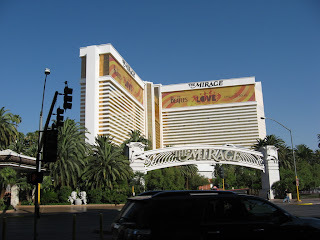 The hotel part of the Mirage is build as three wings on top of the casino, which meet at a bank of elevators. But the elevators are nowhere near the lobby. They actually make you walk past hundreds of slot machines to get to the elevators. The lobby is actually really tasteful and impressive though (maybe some pictures tomorrow), it's a pity to spoil it with the tacky, garish, noisy casino nonsense. That I was kind of expecting. The surprise came when I went to Subway to eat dinner. I'd already found one from Google Maps that was about 500 metres from the hotel, on the Strip. What it turned out to be in practice is a casino with a Subway stuffed into one corner - if I hadn't spotted the signature subway decor I would have thought I'd walked into the wrong place. Well, not a good start to the trip. I start off in Jhb trying to find the VAT office to register my new laptop and camera for re-importation. I made the mistake of asking the first warm body I found, who cheerfully told me that it was after security. So I go through security, don't have to wait for too long at passport control despite the strike, and find... a VAT refund office for tourists, who cheerfully inform me that the place I wanted was before security. At this point I have insufficient time to fight my way back through security twice and stand in a queue to have my goods inspected, so I guess I'll just have to hope that the customs officials on my return are either friendly or on strike. Next I arrive in Frankfurt, my least favourite airport. The only free places to sit are full of stale cigarette smoke, but that part only comes later. I arrived in a terminal full of signs to places like A19-26 but nothing actually helpful and couldn't find a Condor Airlines checkin in the international area, so I went through passport control to navigate the maze to find a Condor checkin. "This isn't an eticket," they say, "you need to collect a paper ticket". So I get directed off the Condor ticket desk, who say they don't have it, but since it was booked through Lufthansa, they might know. So I tootle over to Lufthansa, in a different part of the airport, who tap some keys and tell me that the ticket was issued to the travel agent, and the only thing they can do is treat it as a lost ticket, for which privilege I may pay E100. Wishing to get on the flight, I have now done so. Two passport controls (thank goodness for an EU passport! ), three counters and a security check later (and by the looks of things, possibly a second security check??? ), I'm slightly cheesed off, and am getting on to the coffee and biscuits. Oh, and the internet isn't free either. I'm sure I somehow got on free last time I was in Frankfurt, but apparently it is not to be. I'm posting on my blog, which means it must be time for me to go gallivanting again. This time it is time for the TopCoder Open 2007, to be held in Las Vegas, Nevada. Not only do TopCoder fly everyone out, they are also putting us up and holding the contest in the Mirage! If you're going to follow the contest, I'm in Semifinal room 3 (on Thursday), and the final is on Friday. This time I have new perks. I've now done so much flying with SAA and partners that I've been upgraded to Silver class, which gets me into the business class lounge even though I'm flying economy. I'm sitting in the lounge in Cape Town now. I think I'll go and get myself a cup of tea, while I can still get it made right (see my previous posts for rants about how Americans can't make a cup of tea to save their lives).